Hawaii. Our happy place. John is 14 months and we made the hop, skip, & jump over the Pacific ocean to Hawaii. We went into our trip with ZERO expectations for our 13 hour travel day. Actually, I take that back, I expected multiple freak outs, inconsolable toddler screams, & rolling eyes of nearby passengers. Luckily, we didn’t encounter ANY of them! He was such a trouper! We packed tons of snacks, (baby food pouches, nutrigrain bars, peanut butter crackers, cereal puffs, ext). I went to the dollar store the night before and found a few new toys as we all know toddlers only like to play with their toys for a few min before they’re forgotten. We also brought along the iPad and had some nursery rhyme videos downloaded for those urgent needs. We did encounter a hiccup, but as a nervous traveling mama I was prepared. On the last leg of the flight there, I noticed baby John felt pretty warm. I thought all the sleepy plane cuddles could have been causing it, but when he was still warm when we got to the hotel I unpacked the thermometer and it read 104.0. UGHHH not exactly how I saw our trip starting out. Long story short, he had a viral infection Roseola & his fever lasted a little over 24 hrs luckily with no other symptoms other than a rash after his fever broke. So make sure to pack all the “first aid” essentials. For us it was a thermometer, infant Motrin, gas drops, & diaper rash ointment. Hopefully you won’t have to use it but better safe than sorry when you’re already feeling helpless. Okay, now back to a few more tips on traveling time distances with a little one. Obviously traveling to Hawaii once with a toddler doesn’t make me a expert whatsoever but hopefully our experience can help any other anxious mamas traveling with their little one! 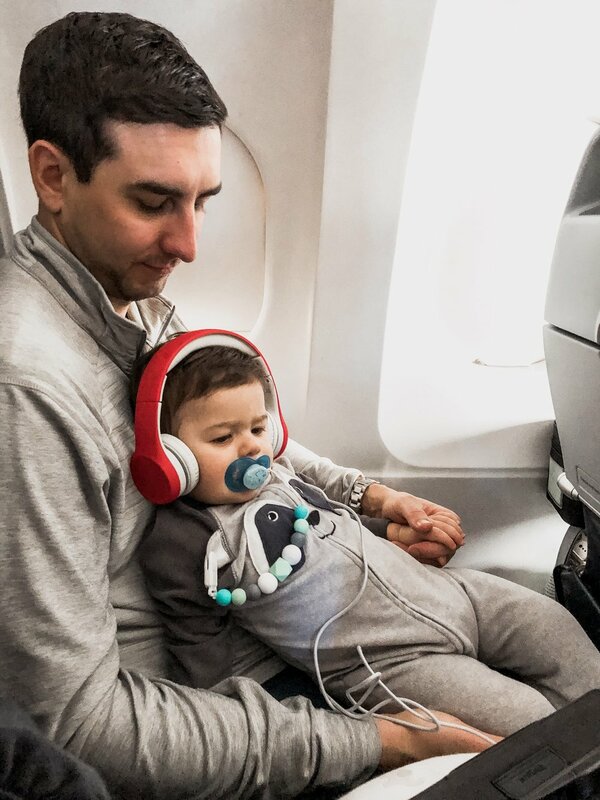 If you are traveling east to west and the time difference just isn’t feasible to maintain your same time zone, try adding in a catnap to help your little one make it to bedtime. For example, John typically goes to bed around 8:00 pm in Ohio. While visiting Hawaii, that would equate to a 3:00 pm bedtime. This simply isn’t possible. We didn’t adjust him COMPLETELY to the 5 hour time difference as we thought the adjustment after vaca would be a little easier. So instead of 5 hour difference, he adjusted to about a 3 hour difference. Some days he would take a mid afternoon cat nap and other days he fell asleep in the stroller while walking into dinner and stayed asleep the entire time which, hey, I can’t complain about! We just went with the flow and tried to accommodate to whatever scheduled he let us to. When adjusting to a different time zone, make sure to use light to your advantage! During your baby’s awake time, be active and exposed to as much daylight or even bright indoor light as possible. This naturally helps your baby to adjust to the local time. As for early morning wakings: please be sure to keep the baby’s room as dark as possible. This will help to keep your baby from waking up quite as early in that unfamiliar environment. This resort is huge & requires stamina to get around beautiful grounds. I do have to say, with transporting a toddler around in a stroller, there were not enough elevators around. We stayed at the farthest tower so it was easily over a half a mile walk to breakfast (the other side of the resort) each morning, we could have taken the monorail but waits were always long and felt like we walked faster than it moved. But the views were excellent and there are a few restaurants on location that are so convenient with a little one. I enjoyed the lagoon at the hotel because it offers protection from the surf and even the littlest of babes can enjoy the serenity of the water. This is not a kid friendly hike, we kept the baby back at the hotel with my parents. The road down to Waipi’o valley is one of the steepest roads on the island. On the steepest part, it rises 800 ft in only 0.6 miles. The average grade of the road is 25%, but peaks at 40%. Walking or driving down this road will give a good tilt to your horizon :). Kua Bay was by far my favorite beach on the Big Island, and I must say, it is a beautiful turquoise water beach with soft white sand. The color of the water is stunning and it's probably the only one I might consider white sand. We were able to swim in the water and it was crystal clear. It was pretty popular when we were there, but we found a spot no problem. We had to park far away but we got to the beach pretty late in the day. We also brought our own sand umbrella which was perfect because there was no shade. We didn’t bring out stroller & it would have been very tough if we did, there are a few rocks to step down when you first get there. I would definitely suggest checking this spot out!! Venturing out to dinner was hard with a toddler but we managed to have the most perfect evening at Lavalava. Our hotel had a shuttle to the Marriott & we walked to Lavalava along the beach from there. Baby John fell asleep during the walk over and stayed asleep the entire time, even through all the noise in the restaurant, so it was kinda like we had a kid free evening. If you go to Lavalava expect a long wait, theres no way around it. But we sat on the beach and had a few cocktails which isn’t the worst way to wait for dinner. We ordered the ahi nachos which were DEVINE, I tried the coconut shrimp and pineapple fried rice. Aaron got the teriyaki steak and I found myself stealing bites of his thought dinner! The view of the sunset from our table couldn’t be beat! Any other great tips? Comment below, we all know anything any input can be helpful when you’re traveling with little ones!